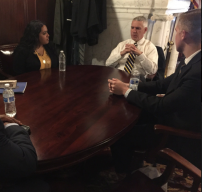 The University of Pittsburgh promotes civic engagement, community service, and local partnerships to bring University resources to the community and region. Sustainability initiatives and resources are also available to help you connect with your community, get involved with on-campus initiatives, and promote green practices at home. In keeping with our mission, Pitt aims "to make available to local communities and public agencies the expertise of the University in ways that are consistent with the primary teaching and research functions and contribute to social, intellectual, and economic development in the Commonwealth, the nation, and the world." 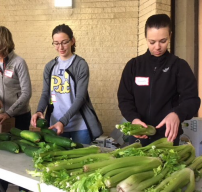 Every year, the University of Pittsburgh provides service in partnership with the local community and with Oakland partners. Opportunities to get involved throughout the year can be found on the Pitt Cares page, where you can also find information on becoming a Pitt Advocate, how to apply for internships, and sign up for the Pitt Cares Volunteer newsletter. Faculty, staff, students, and alumni are all welcome to volunteer with Pitt Cares. Get involved in helping the University of Pittsburgh stand for our future with Pennsylvania. Collaborate with elected officials to support the University with advocate opportunities, write your legislators, and share the word with your family and friends on social media. Help us strengthen Pennsylvania’s future together. Let your friends, family, neighbors and representative know that, With Pitt, Pennsylvania Wins. Please visit the Office of Community & Government Relations in person or online for available resources and opportunities on campus and around Pittsburgh. Apply for a position on Talent Center, the University's online employment system, to join the ever-growing Pitt community! The Pitt community is full of students, faculty, staff, and alumni who are constantly making strides for the University. We are recognized for excellence in athletics, research, academics, and more, all thanks to our community of achievers. Learn more about achievements and traditions at Pitt. Revised 04/23/19Copyright 2019Site by Communications Services Web team Send feedback about this site.